"This is a tasty recipe that my whole family enjoys. Very easy to make!" In a medium skillet over medium heat, brown the ground beef and drain fat. Add the diced tomatoes with green chile peppers, water, sour cream and taco seasoning mix. Let simmer for 5 to 10 minutes. In the bottom of a 9x13 inch baking dish, place a layer of tortilla chips. Cover with a layer of the meat mixture then a layer of cheese. Repeat this process until the last layer is cheese. Bake in the preheated oven for 20 minutes, or until the cheese is bubbly. A flavorful taco soup with ground beef, taco seasoning, beans, and green chiles. I found this to be just okay. I would not make it again. I threw this together because plain ol' tacos sounded kinda boring. Turns out, it was a good move! It was a big hit at my house, made evident by the fact that it didn't last very long at all! 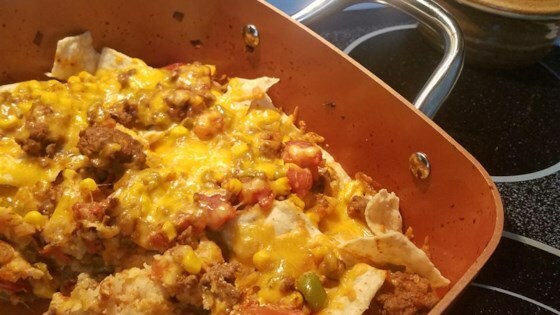 very good recipe-we changed it up a bit by not adding the tortilla chips until serving the beef mixture- it made it crunchy so my kids would eat it and still had a very nice taste to it!